The 2015 Dodge Challenger SRT Hellcat puts out 707 horsepower. The 2015 Dodge Charger SRT Hellcat also puts out 707 horsepower with the same 6.2L supercharged V8 engine. The 2014 Supercharged GT500 Mustang put out 662 horsepower. 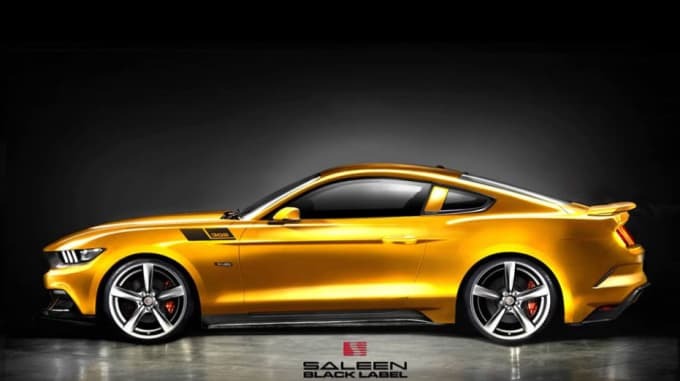 The 2014 Saleen Mustang 302 put out 625 horsepower from its 302-cubic-inch supercharged 5.0L V8. And now we have the 2015 Saleen Mustang S302. Officially announced today, the Saleen &apos;Stang gives buyers up to 640 horsepower in a reimagined body of the completely redesigned 2015 model. But is that enough? Lead by the Hellcat siblings, there is seemingly a reignited desire in the muscle car world to create the most brash, obnoxiously powerful brute possible. This Saleen doesn&apos;t even oust last year&apos;s GT500 in the HP category, and the previous S302 had only 15 HP less. Which is why (and surely some of you will think this is stupid) 640 hp kind of feels like the California company could have done better. This is a brand new Mustang, after all. Yes, it&apos;s also lowered, has bigger wheels, has new aero in the front and rear, has an induction hood, tunes the suspension, and adds alcantara inside, but c&apos;mon, only 15 more? Y&apos;all needed to do better than that to really make a splash in the current market. 700 is the number that&apos;s going to stick in people&apos;s heads. If you&apos;re in the market for one of these models, which, despite our point about the power, will still be amazingly incredible vehicles, there will be three options: White Label, Yellow Label, and Black Label. The naturally aspirated engine will give you 450 hp and 410 lb-ft. If you want to reserve one, you&apos;ll have to hand over a $2,015 deposit.